PASO ROBLES – In the recent “Best of California Wine Competition 2013” Hunt Cellars, a Paso Robles based boutique winery, was just notified that in this competition held by Food and Beverage World, Hunt Cellars won four out of the 11 Categories. David Hunt, winemaker and owner of Hunt Cellars, said he was absolutely amazed and honored that we won these categories against over 100 of California’s top wineries from Paso Robles, Napa, Sonoma, Santa Barbara, Santa Ynez, Lake County, Monterey and others. Hunt said, “I knew the 2010 Viognier was good, but did not know how good the competition was so I was grateful to have won Best White Wine again”. 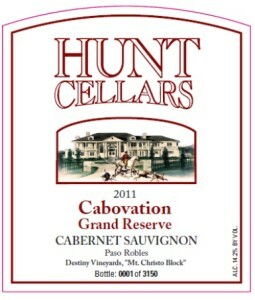 In the last few months Hunt Cellars has received 96 to 96 plus scores for five of their Cabernets, 05, 07, 09 Cabovation Reserve Cabernet, 96 for the 2005 and 2009 Cabernet Reserve Cask 21, 96 points for their 2009 Pinot Noir “Imagine”, 96 Points and winner of “Best Rhone Blend” 2006 “Que Sirah Syrah”, 96 Points for 2007 Zinfandel “Rocketman” and 96 Points for their Tawny Port “Oldie But Goodie”. Hunt has also received numerous 95, 94 and 93 points. David Hunt can be reached by telephone at 818-700-1600 or email huntwine@gmail.com. 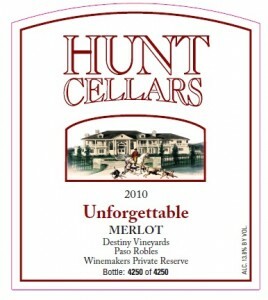 Hunt has recently received accolades for many of their 2013-2014 releases. The names say it all – Maestro, Thriller and Bon Vivant all received 92, 93 or 94 points. An extensive insight into David’s life work by Brett Johnson of Inside VC (now the Ventura County Star). SWEET LIFE: What will be has been for vintner David Hunt, who brings light to a world that is growing darker. The kid who used to bump into trees while trick-or-treating came west to California in the 1970s as a starry-eyed musician and wound up in the grapes of success, even as his world view became hopelessly stuck on a dimmer switch. February 22-23 ~ 4th Annual DC International Wine & Food Festival ~ DC Convention Center. “Pay attention to how David Hunt pours a glass of wine this weekend. His left hand will weight your glass so he doesn’t overfill it; his right hand will be just at the mouth of the bottle, making sure he doesn’t miss the glass altogether. An interview with David Hunt by Fred Bouchard of Beverage. “’Who wants to be second place?,’ David Hunt once told a visitor who noticed he didn’t display any silver medals awarded. Spoken like a man used to bringing home the gold. 93 Points – Hunt Cellars 2000 “Oldie But Goodie” Tawny Port (Paso Robles); $100. “Really nice California Port-style wine, rich and very sweet, soft and complex, and so easy to drink now. It’s a lighter-bodied style, where the tannins don’t get in the way, and the milk chocolate, cassis, root beer, cola, caramel, licorice and spicy vanilla flavors are simply delicious.” — S.H. Wine and Jazz magazine returns to a look at David Hunt in their October 2012 issue. 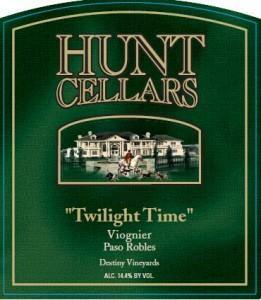 Food&Beverage World names Hunt Cellars wines in its wines of the year list. “David Hunt was almost a reality television star in the 1960s. At age 21, he was invited to California for a chance to appear on the television program The Dating Game, a precursor to programs like The Bachelor. So he packed up his MG convertible, and with just $35 in cash and ambitions of becoming a musician, he headed west from his North Carolina home to seek fortune and fame. To read more please click on the following link. In the mid-1990s, David Hunt was in a race against time. A degenerative eye disease called retinitis pigmentosa was sapping his vision. The malady that ran in his family — affecting his two brothers and father — had been roaring through David’s life since his 20s. Threatened with complete loss of sight, Hunt could have capitulated to the condition — and anyone would have understood. Instead, he found his sanctuary. 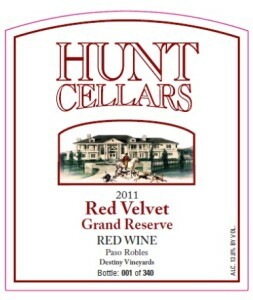 In 1996, Hunt opened his namesake Hunt Cellars, a winery on 550 acres in Paso Robles between San Francisco and Los Angeles. Today, his company moves nearly 8,000 cases per year of cabernet sauvignon, sangiovese, merlot and other varietals from its Golden State nest, with wine bottles ranging from $22 to $160 apiece. That’s a far cry from the outset, when Hunt was an unknown brand with a fledgling enterprise. When he opened for business, his was just the 37th winery in the area. Now the central coastal region boasts 250 such firms. His vineyard operation — and subsequent career as a musician — is an accumulation of a life’s work and something Hunt would not be denied. Growing up in North Carolina, Hunt had one option: hard work. The third youngest of seven kids cut his teeth working for his dad’s lumber business starting at age 6 — chopping and stacking wood and generally being resourceful. The Hunt family got by, but that was about it. Living in a small house by modest means wasn’t something that captivated the young man with loftier goals. Reading the books of Dale Carnegie and Napoleon Hill helped teach Hunt about personal success, but it was the “Go West, young man” advice of an earlier author — Horace Greeley — that he ultimately chose to follow. Hunt had always been a music lover and dreamed of a career as a performer, but figured his chances of hitting it big in such a challenging profession were slim. Still, at age 21 he found a possible way into the entertainment arena. Chuck Barris’ TV show “The Dating Game” invited him to appear, so Hunt trekked to Los Angeles. 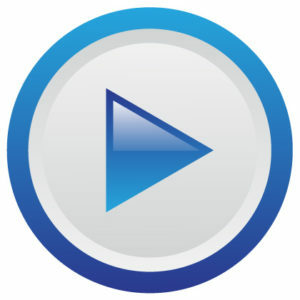 The Tar Heel didn’t get the girl — and pressed pause on the music gig — but scored big in an emerging industry: technology. When security “went from being a product for jewelry stores and businesses to being needed in homes,” Hunt was there to capture some of the windfall. His worsening vision diminished the businessman’s ability to read in his 30s, but not his entrepreneurial savvy. In the 1970s he claimed patents for security and telephone line detection devices that would make their way into home security systems and voicemail. In his 40s, Hunt shifted gears. He sold his patents and businesses, fled the security game and followed his passion: winemaking. 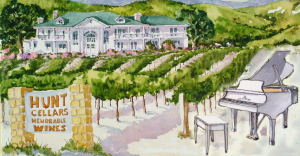 Drawn by the creativity the field offered, Hunt enrolled in three extension classes in oenology offered by the University of California, Davis, in the 1990s. After learning the basics of vineyard management and grape growing, he gave people a taste of his new pursuit. Hunt — whose vision was severely diminished at this point — saw enough in the San Luis Obispo County land to purchase a plot in the central coast and plant his first vineyard in 1996. A public tasting room complete with colonial architecture and picnic space followed in 1999, and a bucketful of awards have come since. Nearly every Hunt Cellars wine rated by Food & Beverage World — an industry publication — has scored above 90 on a scale of 100. Gems include the 2007 Rocket Man Zinfandel and the 2009 Imagine Pinot Noir, both scoring 96. 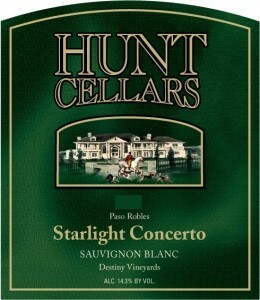 • Hunt Cellars 2001 Paso Robles Starving Artist Barbera earned a stratospheric rating from Wine Enthusiast magazine. 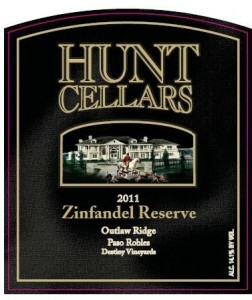 • Hunt Cellars 2001 Zinful Delight Zinfandel Port won double gold medals at the 2006 San Francisco Chronicle wine competition. • Hunt Cellars 1999 Rhapsody Meritage won a gold at the 2004 Florida international wine engagement. Aside from the cheers for making good wine, Hunt chases his own system of grape euphoria. “I push the threshold of mixing the science with the art,” he said. Some of it comes naturally. The vintner relies on his strong palate and heightened senses to compensate for not being able to see. Hunt, who is hands-on throughout the winemaking process, tastes and feels the grapes and smells their ripeness to gain an edge. His dedication and skill have paid off in the form of happy customers. 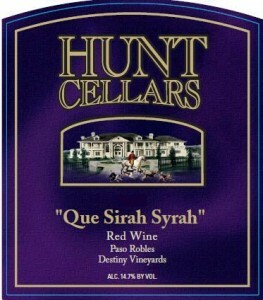 Hunt’s wine — which is handcrafted in small lots and receives extended barrel aging — is sold in restaurants like Morton’s and Ruth’s Chris Steak House. 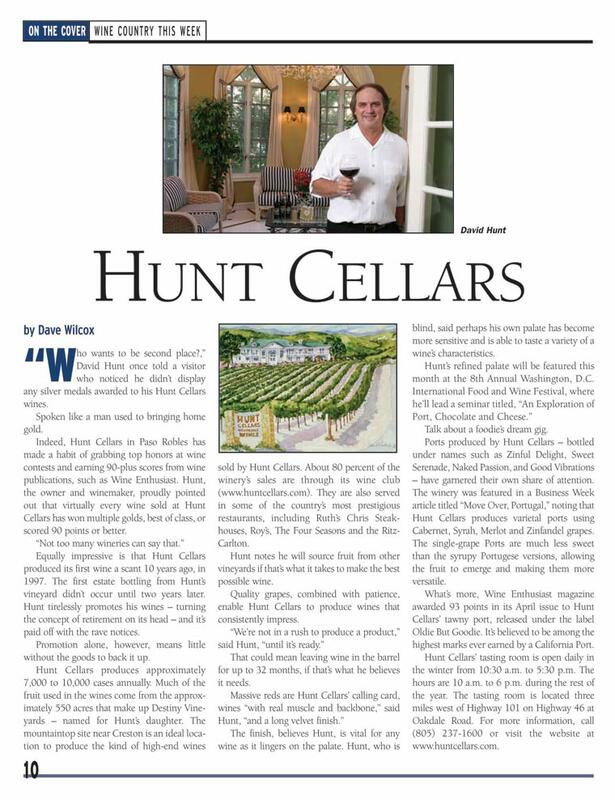 David Weisman, a Hunt business associate and friend for 10 years, knows why the good stuff keeps flowing at Hunt Cellars. Hunt also knows his tunes. After the hiatus to get his businesses off the ground, the music maker went hard after his original dream. 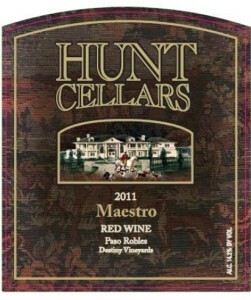 Result: “Rhapsody in Red,” a 12-song album released by Hunt in 2012 that features odes to many of his California wines. Titles such as “Hilltop Serenade,” “Cloud 9” and “Bon Vivant” are soundtracks for wine country living. Hunt wrote all dozen songs, plus providing lead vocals and piano. 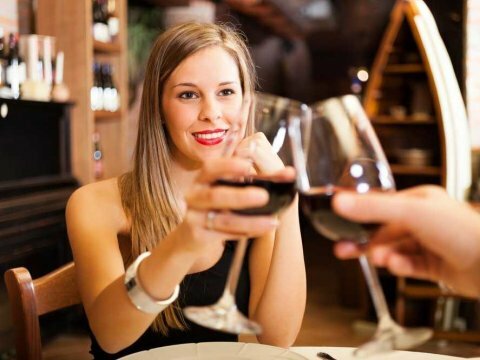 He stages dinner concerts at his winery every couple of months and pairs his album with six-bottle packages of wine, a clever move for sales after his guests have been serenaded with the piano ballads live. Wine offers plenty of stimulation. Hunt also gets his musical spark from family. The song “Destiny” is named after his only daughter — the winery’s Destiny Vineyards also shares the moniker — who was born the year Hunt Cellars opened. Hunt lost his eyesight for good in the early 2000s and has never fully seen his daughter’s face. He caught only shades and shapes after she was born. Three tracks are written about Hunt’s wife of 37 years, Debbie, who has been his rock. Hunt’s album has some orchestral hints with touches of blues and soft rock. The message for young people especially strikes a chord with the architect. Despite his blindness, Hunt keeps pushing. In the works is an inspirational CD aimed at adolescents. He hopes to expand Hunt Cellars to reach more traffic by building a new facility and tasting room in Temecula, a budding wine hub between Los Angeles and San Diego. Meanwhile, he works with charities Fighting Blindness, RP International, LightHouse and Stillpoint Family Resources to help those with degenerative eye disease through fundraisers, wine tastings and other events. 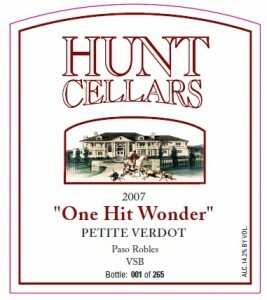 Hunt Cellars featured in fbworld.com Winery-of-the-Week profile. Read More…. David Hunt introduces the winners in the Best of California Wines, 2015 edition. Five Hunt wines were awarded Wines of the Year in 2015. Read More….